ASUS’ elite ZenBook range was developed in 2011 as the company’s thinnest and lightest laptops, created using the latest technologies, and using the best premium materials. During the first ZenBook’s inception, its creators wanted a minimalist design based on the Zen principles of Kanso (簡素), which means simplicity by eliminating clutter, and Seijaku (静寂), which means tranquility; both of which would evoke a sense of “comfort” and “balance”. The ZenBook Pro 15 is designed for demanding professionals by including all the latest technologies in a sleek and premium design. It features up to a super-fast 8th generation Intel® Core™ i9-8950HK hexa-core processor, powerful GTX 1050 Ti graphics, 16GB of high-speed 2400MHz memory, and up to a 1TB PCIe-based SSD with up to 3.2GB/s read speeds! The Intel Core i9, i7 and i5 processor options for by the ZenBook Pro 15 are the most powerful mobile processors available from the latest 8th generation of Intel CPU models. They feature six cores and up to twelve computing threads to offer up to 29% faster performance1 compared to the their 7th generation predecessors which are still considered extremely powerful even by today’s standards. The ZenBook Pro 15 features a media-powerhouse NVIDIA GeForce GTX 1050 Ti not only capable of accelerating the heaviest of workloads but also of smooth 1080p gaming at high setting on many modern titles. With significantly more CUDA processing cores, the “Ti” version offers greater graphics processing power compared to the standard GeForce GTX 1050. The ZenBook Pro 15 is the first ZenBook to feature 802.11ac Intel Gigabit WiFi that provides the fastest wireless network speeds when paired to compatible routers that are becoming increasingly common. The ZenBook Pro 15 bears the stunning ZenBook industrial design of its predecessors. 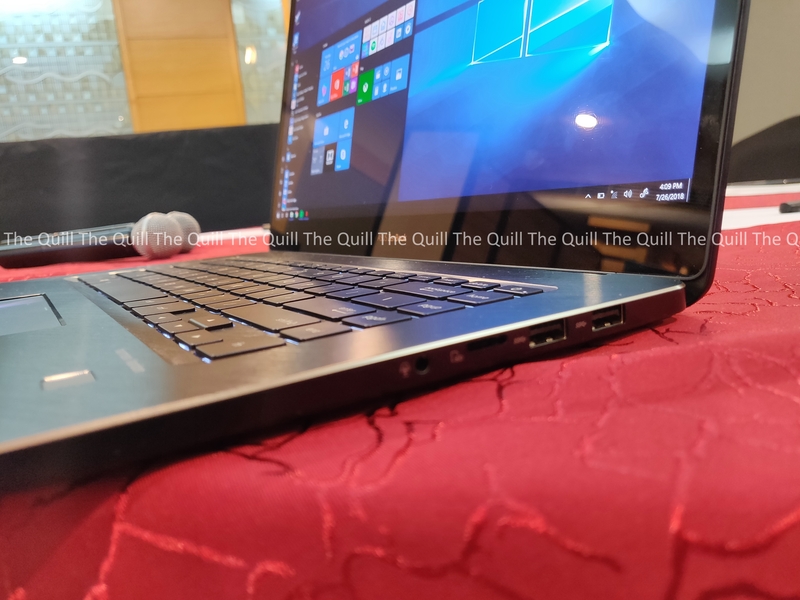 The ZenBook Pro 15 had to have its internal systems redesigned in order to accommodate its demanding specifications that now included a 15.6-inch display, an elite graphics engine and a set of top-end performance components like the Intel Core i9. 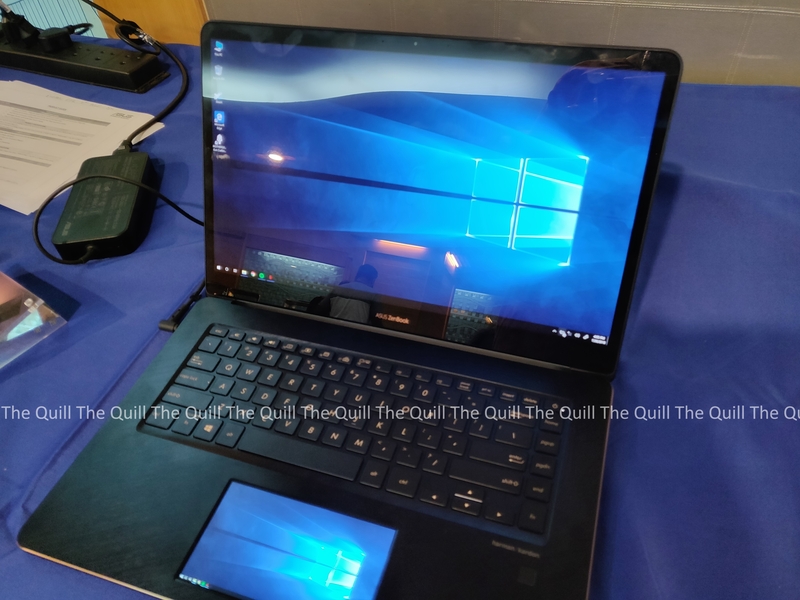 Although the ZenBook Pro 15 has a 15.6-inch monitor, its slim display bezel and lithe chassis give the laptop the rough physical dimensions of a 14-inch ultrabook laptop. As with all ASUS ZenBook models, the ZenBook Pro 15 embraces the iconic design accents of the ZenBook series first introduced with the ZenBook UX21 that was launched six years ago. These include the signature tapering edges, concentric spun-metal finish concentric circles on its lid and diamond cut chamfered edges around its keyboard. The ZenBook Pro 15 is available in an elegant “Deep Dive Blue” with Rose Gold diamond cut chamfered edges. ScreenPad Launcher – The launcher is the fastest way to launch your favorite apps. Simply tap an app icon to launch the app. You can also add and personalize it by adding or removing apps from the Launcher by tapping on the edit button next to the X in the upper right-hand corner. ScreenPad Online Video Player – ASUS has built-in full Google Chrome-YouTube support with a Chrome extension, for video playback including ad skipping, full-screen mode, and volume and timeline adjustment. ScreenPad Office – Get instant fingertip control of common functions when you’re editing Excel, Word or PowerPoint documents. Using ScreenPad™ for edit functions means you can enjoy a bigger workspace on the main screen, helping to keep your creativity focused. ScreenPad NumKey – This turns the ScreenPad into a number keyboard for easy data entry. ScreenPad Calculator – This is the ScreenPad’s built-in calculator, allowing you to crunch numbers when your screen is already full of other websites, spreadsheets and documents. Overall, The New Zenbook Pro 15 is filled with features and packs quite a performance punch. More to come in the full review.